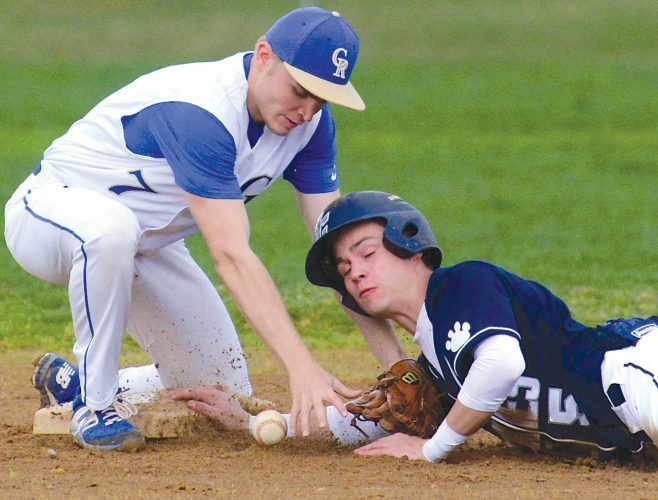 JOHNSTOWN — Bishop Guilfoyle Catholic’s Tyler Berkheimer homered and drove in three runs, and Austin Hammerle allowed just two hits in a five-inning shutout of Johnstown, 10-0, at Roxbury Park in high school baseball Saturday. Kenta Okada scored three runs for the Marauders. BISHOP GUILFOYLE (10): Okada ss 231, Potopa c 401, Fanelli 3b 210, Yasulitis rf 312, Reighard lf-cf 422, Berish cf 210, Berkheimer lf 111, Hammerle p 201, Georgiana 1b 310, Carrieri 2b 210. Totals — 25-10-8. JOHNSTOWN (0): Brothers c 300, Kobal ss 201, Mastovich 3b 300, Flis dh 201, Levontry dh 100, Zierer 1b 000, Mann p 000, Johnson cf 200, Yingling p-3b 100, Tisinger rf 200, Baumgardner 2b 100, Parrish lf 100. Totals — 18-0-2. E–Okada, Potopa, Georgiana, Mastovich, Yingling, Baumgardner. HR–Berkheimer. RBI–Fanelli, Yasulitis 2, Reighard, Berkheimer 3, Carrieri. WP–Hammerle. LP–Yingling. SO–Hammerle 4. BB–Hammerle 5, Yingling 3, Mann 2. Records: Johnstown (0-5); Bishop Guilfoyle (5-1). TYRONE — Winning pitcher Kevin Lehner drove in four runs and scored three to lead Tyrone to a victory over Penns Valley. Nic Light drove in three runs for the Golden Eagles. PENNS VALLEY (3): Shaffer cf 210, Breon lf 301, Upcraft dh 301, Snyder c 200, M. Tobias 1b 300, Darlington p-2b-3b 300, A. Tobias ss 310, Kauffman 3b-2b-p 301, Kines 2b 111, Gillespie 3b-2b 000. Totals — 23-3-4. TYRONE (13): Pearson cf 431, Hunter rf 432, Lehner p 332, Lehman c 313, Light 1b 301, Woomer 3b 301, Shultz 2b 300, Savino ss 211, Gearhart lf 422. Totals — 29-13-12. E–Daniels, M. Tobias, A. Tobias, Kauffman, Kines 2, Savino. 2B–Lehner, Lehman. RBI–Breon, Upcraft, Kauffman, Lehner 4, Light 3, Lehman 2, Hunter, Woomer. WP–Lehner. LP–Darlington. SO–Kauffman 2, Lehner 5. BB–Darlington 5, Kauffman 1, Lehner 3. ALEXANDRIA — Jacob Hensor went 3-for-3 with three runs scored and drove in two as Juniata Valley topped Williamsburg. Jack Johnson went 2-for-2 with two runs scored for the Green Hornets, and Gabe Brower drove in three runs. Rashadd Knorr had the Blue Pirates’ lone hit. WILLIAMSBURG (3): Hileman 2b 300, Michelone ss-p 110, J. McCall 3b 120, Knorr p-ss 201, Clark c 200, W. McCall cf 100, Brantner lf 200, Post 1b 100, Webb rf 200. Totals — 15-3-1. JUNIATA VALLEY (14): Derugen cf 100, Hurley rf-lf 210, Brower lf 121, Watson lf-cf 100, Hensor ss-2b 333, Zinobile rf-cf-ss 212, Z. Richner p 301, Reed rf 100, N. Richner 1b 100, Wilson 1b 201, Hess c 121, Harris c 100, Rupert 2b-p 121, Johnson 3b 222, Showalter 3b 101. Totals — 23-14-13. E–Knorr. 2B–Hensor. RBI–Knorr, Clark, Hurley, Brower 3, Hensor 2, Zinobile 3, D. Richner, Wilson, Hess, Johnson 2. WP–D. Richner. LP–Knorr. SO–D. Richner 5, Rupert 2, Knorr 6, Michelone 4. BB–D. Richner 1, Rupert 4, Knorr 7. Records: Williamsburg (1-5); Juniata Valley (6-1). JOHNSTOWN — Luke Chobany delivered three hits in Portage’s win over Conemaugh Valley. Jackson Kozlovac had two hits, and Noah Kerch and Albert Koenigsberg combined on a three-hitter. Taylor Cordwell had a run-scoring triple. PORTAGE (3): Kozlovac 2b 402, Wiggins ss 311, Kerch p-rf 300, Irvin 3b 201, Herman pr 010, Randazzo lf 400, Chobany dh-1b 413, Piatak rf 000, A. Koenigsberg 1b-p 200, Cordwell ph 101, M. Koenigsberg c 200, George ph 100, Price cf 200. Totals — 28-3-8. CONEMAUGH VALLEY (2): Toth cf 200, Siva 2b 300, Levis ph 100, Smith lf 101, Miller ss-p 300, Markiewicz p-ss 300, Justinus 1b 210, Kovalchick c 100, Molnar rf 301, Cruise 3b 311. Totals — 22-2-3. E–Kerch. 2B–Kozlovac 2, Wiggins, Irvin. 3B–Cordwell. RBI–Kozlovac, Irvin, Cordwell, Smith, Molnar. WP–Kerch. LP–Markiewicz. SO–Kerch 11, A. Koenigsberg 1, Markiewicz 5, Miller 3. BB–Kerch 5, A. Koenigsbuerg 1, Markiewicz 1, Miller 1. Records: Portage (3-3; 2-1 WestPAC North); Conemaugh Valley (1-3; 0-2 WestPAC North). PATTON — Joe Kovachik homered, doubles and drove in four runs as Richland pounded Cambria Heights. The Highlanders managed just three hits and gave up nine fourth-inning runs. RICHLAND (18): Kovachik cf 222, Maldet cf 211, Mikesic dh 210, Solarczyk dh 111, Henry dh 100, Blough ss 010, Felton ss 201, Sheffer lf 100, Owens lf 222, Stawarz rf 211, Donald rf 211, Bachota cr 010, Wolf p-rf 210, Ford 1b 101, Holsinger p 111, Vickroy 3b 111, Stem 3b 211, Kaufman 3b 212, Huss p 110, Sloan 2b 110, Kocsis 2b 110. Totals — 28-18-14. CAMBRIA HEIGHTS (0): Williams 3b 200, Hite ss 201, Bearer 2b 200, Lamont dh 201, Link cf 100, Trybus rf 100, Yeckley c 101, Work lf 100, Mock lf 100, Kirkpatrick rf-cf 100, Hoover 1b 100, Galinis p 000, Jamison p 000, Miller p 000. Totals — 15-0-3. E–Stem 2, Hite, Hoover. 2B–Felton, Stem, Kovachik, Kaufman, Stawarz. HR–Kovachik. RBI–Kovachik 4, Maldet, Solarczyk, Blough, Felton, Stawarz 2, Ford, Vickroy, Stem, Kaufman, Sloan. WP–Huss. LP–Jamison. SO–Wolf 5, Huss 3, Jamison 2, Gallinis 1. BB–Huss 1, Jamison 1, Gallinis 2, Miller 1. Records: Richland (2-3); Cambria Heights (2-3).